When the move began to seem imminent, I began scouring our pantry for foods better eaten now than packed in one of the many cardboard boxes and reusable cloth bags. 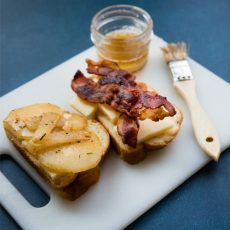 And, there they were, gleaming pearls in the shelf of whole grain filled jars. 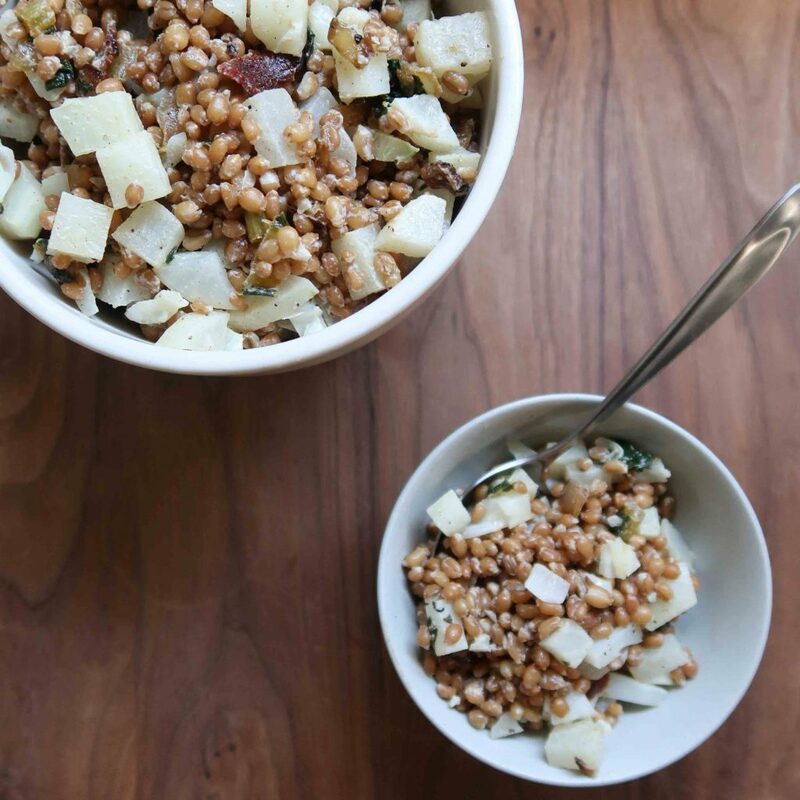 Wheat berries offer a hefty chew and hearty addition to a lunchtime salad. 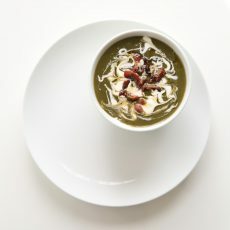 Though we are certainly in the throes of Spring, the humble and under-appreciated turnip turned up into this February salad too. I’m harboring plans for fall and winter to pursue the potential in this root vegetable even as we are decidedly in asparagus and pea season. 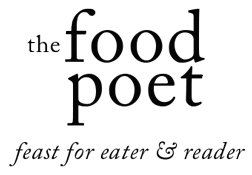 But like a good poem, a recipe is never too late in arriving. It comes just when it needs to, even after a gestation period that turned out to be longer than intended. Even after we end up surprising ourselves with the courage required to take our creative work deeper by rooting down and filling new rooms with ideas. Even if there’s still no room for a leather jacket. 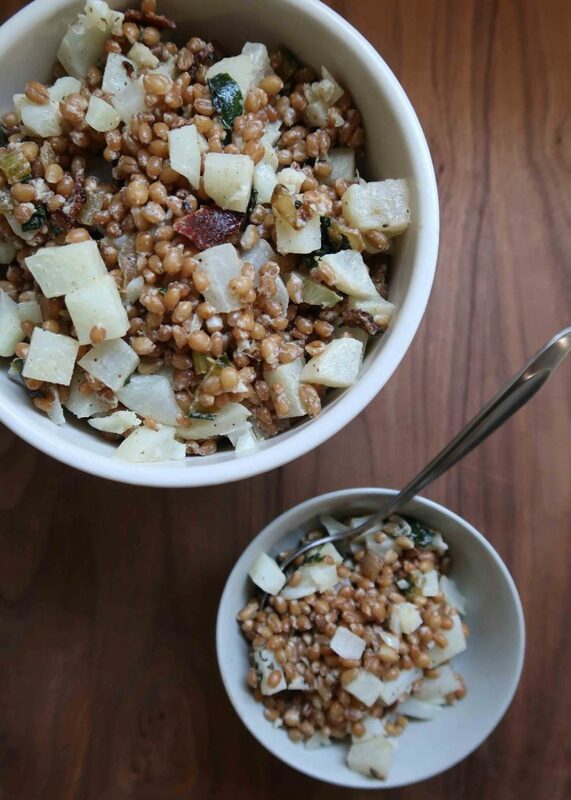 Place the wheat berries in a large bowl. 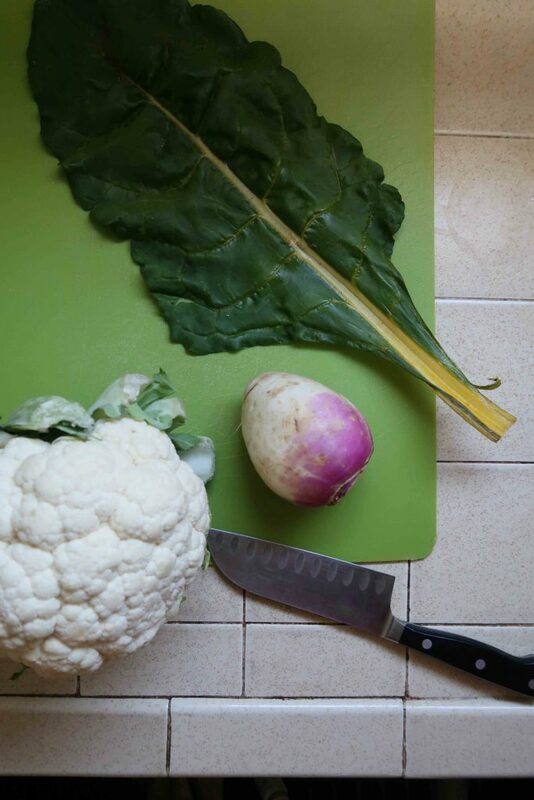 Steam the turnip and cauliflower stalks until fork tender. Add them to the bowl with wheat berries. Meanwhile, fry the bacon. Remove the bacon from the pan with a slotted spoon. Saute the leeks, Swiss chard, salt, and pepper in the bacon fat until cooked down, about 4 minutes over medium low heat. Add the cooked Swiss chard to the bowl of wheat berries. Mix together the tahini and lime juice. If it’s too thick, add 1/2 teaspoon of water. 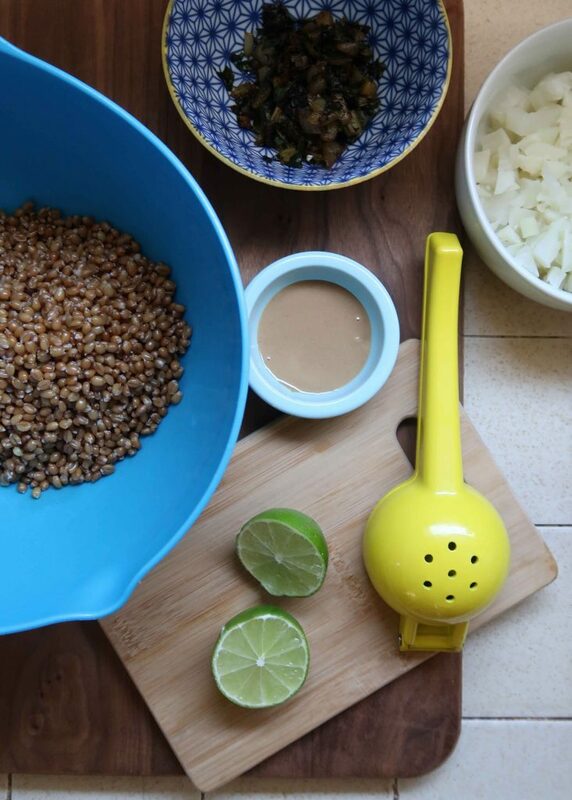 Pour the tahini sauce over the wheat berries. Toss and serve. PS- This salad is best eaten on the day it’s made. (Try to stop yourself after it’s just tossed). PPS- Make this salad gluten-free by swapping out the wheat berries for brown rice. It’s got a similar grit and sense of self-import that matches the swagger of this salad. 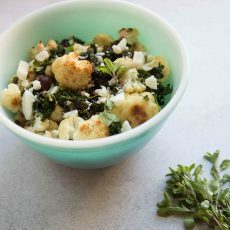 PPPS- Stash the cauliflower florets to use in a different recipe. I like to take stock and provide ideas for using the less pretty bits of vegetables like cauliflower stalks. If the size shown here is too ungainly, feel free to chop them into smaller chunks.